Thanks for stopping by - there's going to be plenty of stuff coming up this year (especially Frog-related) so be sure to pop by again and/or follow me on Twitter. I'll also be out and about a lot in 2014 at schools, festivals and pencil conventions, so if I see you do please wave and tell me your favourite sandwich filling. In the meantime, wrap up warm, eat some cheese and settle down with your favourite book or mythical creature. Have a top 2014. I absolutely insist. 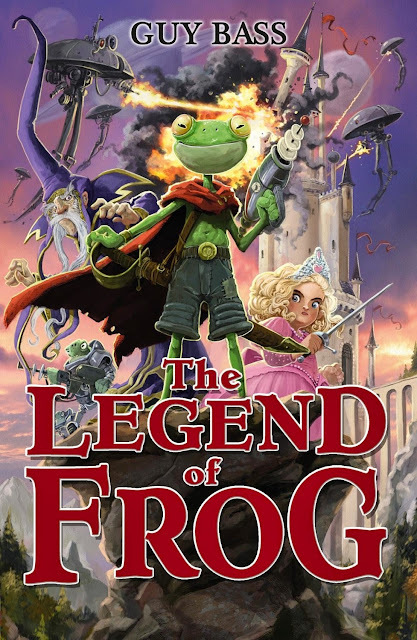 Having a cold is bleh but the the cover my new book, The Legend of Frog, cheers me up more than a sack full of Santas. Check out the amazing artwork by Jonny Duddle and click HERE to download a sample of the book. Early Christmas present! 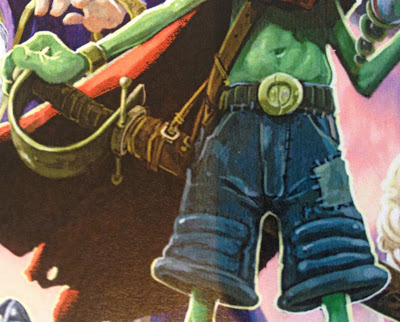 Look out for The Legend of Frog in February. When a frog-like prince ventures beyond the End of the World to claim the throne of Kingdomland, he finds a plucky princess already sitting in the Big Chair. 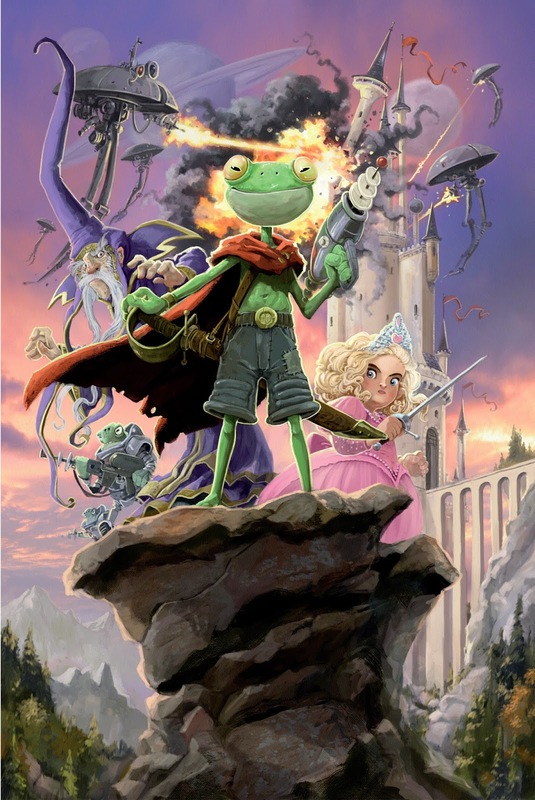 A royal rivalry ensues ... but when Frog discovers he's actually prince of an alien army, he realises he's not destined to rule ... but to destroy. Can he and the princess put aside their differences long enough to save the world? I'm about a week away from holding in my sweaty hands the first proof of my new book, The Legend of Frog. The cover, by none other than writer/illustrator/Emperor of Art (and character designer on Pirates! In an Adventure with Scientists) Jonny Duddle, may be the best thing I've ever seen with my lucky, failing eyes. When you see it you may combust, or die from joy. I know I did. More and more to come soon, but here's a teaser to wet your whistle. Pants! Click here to chew on a synopsis of the book, released in February 2014. With another book done to pieces, the Overlords have let me back into the so-called sunshine to wave giddily at folk. I'll be out and about at schools, libraries and festivals over the autumn. 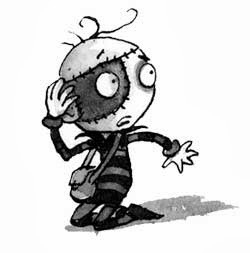 It'll be a whole lot of Stitch Head and, maybe just maybe, a little of my new book, The Legend of Frog. See you there! Unless you can't make it, in which case let's, like, defo catch up for coffee soon. The Summer Reading Challenge 2013 is upon us. That special time of year when you get free stuff just for reading books. It's bonkers! And on top of all the Creepy House goodies, participating libraries will also be giving out MYSTERY MUNGLERS TRUMPS cards, created and illustrated by the man who wears my pants - me! 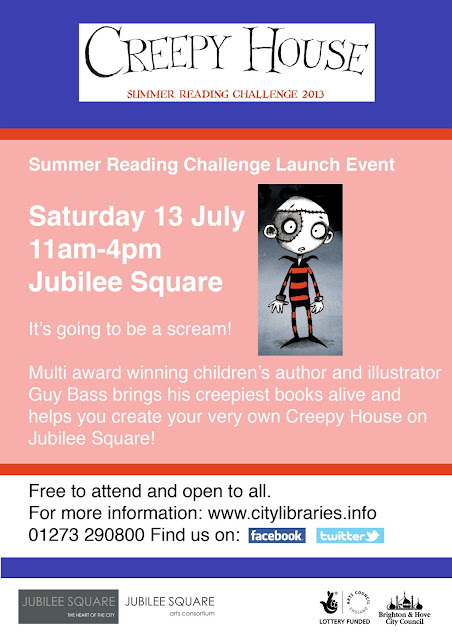 Sign up to the Summer Reading Challenge at your local library and ask about MYSTERY MUNGLERS TRUMPS. It's more fun that eating toast on a boat. Who's free on Saturday? I'm going to be in Brighton to help their libraries launch the 2013 Summer Read. It's going to be creepy houses galore. Galore, I say! Come along and head to Jubilee Square for a free day of stuff for all the family. Except smelly Uncle George. He has to stay at home, the stinker.